Although we are by no means a locally-focused company, with consultant/trainers traveling very widely to lead sessions, we are based in the mid-Hudson Valley of New York State, and one similarly local-but-far-reaching event caught my eye which I thought was very much worth sharing. That would be a nearby exhibition of the work of Saul Steinberg, titled "Illuminations," the artist most famously known for his frequent appearances over six decades in The New Yorker magazine. He was the clever fellow who gave us the much-imitated 1976 cover illustration of how New Yorkers see the world, "The View from 9th Avenue," where a couple of blocks of the city dominate, and the rest of the country occupies a small square of land in the distance. But so much of his work displayed such a fresh, wonderfully creative mind that, for me, it "illustrates" an essential attitude that successful innovators have. This is the habit of looking to see things newly, as opposed to how we usually see, which is through a haze of existing thought patterns; and, freely associating, to find useful connections between things that were hidden until then. 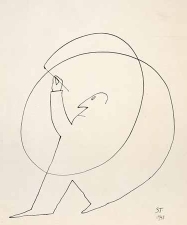 In the words of the Saul Steinberg Foundation's page on his life and work, "fingerprints become mug shots or landscapes; graph or ledger paper doubles as the facade of an office building; words, numbers, and punctuation marks come to life as messengers of doubt, fear, or exuberance; sheet music lines glide into violin strings, record grooves, the grain of a wood table, and the smile of a cat." Bill: The main thing I love about the New Yorker is the cartoons. I rarely read the articles (doh!). I think it would be very interesting to produce a book of "business cartoons" -- insightful and funny perspectives on the world of business. A picture really is worth a thousand words and people, these days, seem to have less and less time to read. The only downside I can see about this book is the cost of getting permissions to reprint them. Still, it's worth looking into. Whaddya think? It's such a good idea that I'm pretty sure it's been done; I believe The New Yorker has one. But that doesn't mean it wouldn't be time to an updated version. 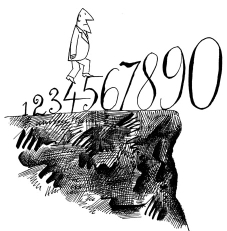 And of course, that magazine isnt' the only source of clever cartoons (-- only the best). Idea Champions is a consulting and training company dedicated to awakening and nurturing the spirit of innovation. We help individuals, teams and entire organizations tap into their innate ability to create, develop and implement ideas that make a difference. Want a Brainstorming Breakthrough? Get the Right Question! If You Want to Innovate, Listen! What Storytelling Themes Most Intrigue You? Click here for the simplest, most direct way, to learn more about Idea Champions' semi-fearless leader, Mitch Ditkoff. Info on his keynotes, workshops, conferences, and more. Storytelling for the Revolution is Mitch Ditkoff's newly published book about the power of personal storytelling to elevate the conversation on planet Earth. Provocative. Evocative. And fun. YOU have stories to tell. This book will help you tell them. "The world is not made of atoms," wrote the poet, Muriel Rukeyser. "It's made of stories." Learn how to discover, honor, and unpack the stories of yours that show up "on the job" in Mitch Ditkoff's award-winning 2015 book, Storytelling at Work. Mitch Ditkoff, the Co-Founder and President of Idea Champions, has recently been voted a top 5 speaker in the field of innovation and creativity by Speakers Platform, a leading speaker's bureau. Your "best and brightest" are the future leaders of your company, but unless they know how to foster a culture of innovation, their impact will be limited. A one-day workshop with us is all they need to begin this journey. Our Heart of Innovation blog is a daily destination for movers and shakers everywhere — gleefully produced by our President, Mitch Ditkoff, voted "best innovation blogger in the world" two years running. Innovation is a team sport. Brilliant ideas go nowhere unless your people are aligned, collaborative, and team-oriented. That doesn't happen automatically, however. It takes intention, clarity, selflessness, and a new way of operating. If you're looking for a powerful way to jump start innovation and get your creative juices flowing, Awake at the Wheel is for you. Written by Mitch Ditkoff, Co-Founder and President of Idea Champions. The world's first interactive business blues band. A great way to help your workforce go beyond complaint.